Park your car at the Pudding Creek Trestle in Fort Bragg, cross the bridge and head north. The trail is flat and paved and comes with ocean views. 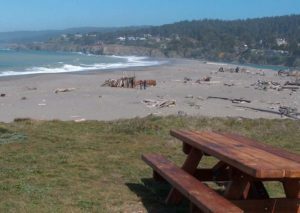 Along the way, you’ll come to Virgin Creek Beach, one of the great surf spots on the Mendocino Coast and a wonderful family beach as well. How long you walk is up to you. Start with a half hour. Remember, in winter the sunset comes before 5 pm, so if you’re out in the late afternoon, carry a small flashlight to find your way back in case the beauty of the place simply makes you lose track of time. Take Highway 1 to Ward Avenue, make a left and drive to the ocean where you will find a parking area. Head north a few hundred yards and you can walk right down to the beach. If you’re looking for a romantic spot (the warm sand dunes along the beach for a blanket and bottle of wine or a picnic), this is the place. The Gardens has several miles of trails that lead you through beautiful gardens that change with the seasons. Along the way you can do a little birding or even take a break and sit on a bench overlooking the ocean. This is a truly wonderful place to walk. By the way, dogs are welcome to join you. The 300-acre state historic park is a wildlife preserve that also happens to offer a half mile walk to the lighthouse (gift shop and museum) and another half mile walk to Frolic Cove, the site of the Frolic Shipwreck in 1850. The trail to the lighthouse (1 mile roundtrip with the first half down hill and the return uphill) offers spectacular views of the preserve and ocean. As you get close to the ocean’s edge, look for whales. They are present year around: Gray Whales – December – April; Humpbacks and Blue Whales – summer and fall. Entrance to the park is free. But the Point Cabrillo Lightkeepers Association is asking a $5 donation to enter the lighthouse — money to maintain the lighthouse, light keeper homes and other buildings — as state budget cuts threatens to close 9 local state parks. You can easily walk here for an hour or more if you follow the dirt trails that branch off the main paved trail that heads down to the lighthouse. Open sunrise to sunset. Gualala Point Regional Park – this park straddles Highway 1, right at the Sonoma/Mendocino Counties border in view of the town of Gualala (wah-la-la). Allow 60 – 90 minutes round-trip. The trail is probably only a couple of miles long, but you will want to take your time, view the crashing surf, wildlife and great views. On the west side of the highway, you enter and stop at a “day fee” post and pay $5, then drive to the parking lots by the visitor center. From there you can head west out to the ocean cliffs and a view point (often windy) or take the trail north onto a long sandy beach. On the east side of the highway is a small campground where you are sheltered in a redwood grove. You’re also by the Gualala River, a calm (temperatures in the 70’s in summer) body of water that’s excellent for swimming, canoeing or kayaking. Most of the year the river mouth ends at the long stretch of sandy beach noted above. I say “most of the year” because in winter and early spring when water flow is heavy, the river breaks through the sand barrier and dumps into the ocean. Manchester State Beach – a long beach is the main attraction here. 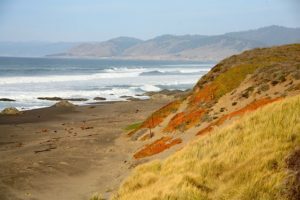 From the California State Parks website I found this description: “The park has a beach, sand dunes, and flat grasslands, with nearly 18,000 feet of ocean frontage. The beach line curves gently to form a “catch basin” for sea debris, which accounts for the volume of driftwood found here. 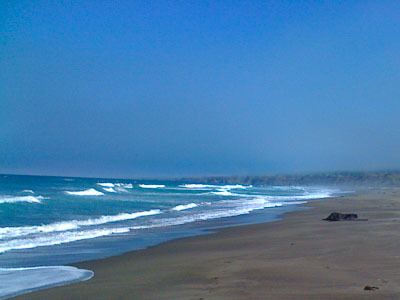 Five miles of gentle, sandy beach stretches southward towards the Point Arena Lighthouse. One of the main attractions is the excellent steelhead and salmon fishing in the park’s two streams, Brush Creek and Alder Creek.” If you want a place to camp where you can get a site year-around, then this is it. Perhaps because the coast is cool and foggy in summer and breezy, as well, the sites don’t fill up as rapidly as they do in other parks. Van Damme State Park – this popular state park is home to one of two pygmy forests and a beautiful fern canyon trail. Besides a privately owned “dwarf forest” in New York, the only place in the world you’ll find pygmy forests are on the Mendocino Coast and the north end of the Sonoma Coast. These are places where the soil is so poor that trees that would normally grow 60-70 feet high, only grow about 6 feet high. Allow about two hours round-trip. Follow the link above for a map and more detail. Big River Beach, Mendocino Headlands State Park – from the Big River parking lot on the east side of Highway 1 near the Village of Mendocino, you can stroll along the Big River, over to the beach and ocean a short distance away. Or head east up the “haul road” (trucks used the road to haul out lumber) and walk for miles overlooking the river. You can also ride your bike, a horse, canoe or kayak. This 7,40 acre watershed and estuary was saved through a campaign mounted by the Mendocino Land Trust. The Trust drew 1,400 donors from across the U.S. and then got the state to come up with half the money — a total of $26 million — to purchase and save this beautiful watershed. Big River’s watershed comprises some of the best timber ground on the planet. And the river and its estuary also are fantastically rich, a haven for 22 species of fish and 131 species of bird, including several that are rare or threatened. Forest History Trail – six miles directly east on Little Lake Street from Mendocino Village is a loop hike in the redwoods. Secluded. Few visitors seem to find it because they don’t venture far from the ocean. But it is a wonderful hike. Jug Handle Preserve – 90-minute roundtrip walk to a pygmy forest and back takes you through 100,000 years of geological history.